Trump’s endeavour to nuclearise Saudi Arabia is driven by family business interests and tacitly approved by Israel. Aljazeera, by Hamid Dabashi, 8 Mar 2019 Like chronic indigestion that refuses to go away, presidential son-in-law Jared Kushner is back causing much discomfort to the general public. But there might be more on their plate than just another bogus “peace process”. Kushner has two paramount concerns while sitting comfortably in the big pocket of Saudi Crown Prince Mohammed bin Salman (MBS): pursuing his own personal financial gains and helping Israel steal what is left of Palestine. MBS also has two objectives while playing with Kushner, like a shiny marble in his pocket: To confront Iran and to establish himself as a ruling tyrant not just in Saudi Arabia but throughout the Arab and Muslim world. As the New York Times recently revealed, the Trump administration has been pursuing a deal with Saudi Arabia to develop its nuclear energy sector. “By ramming through the sale of as much as $80 billion in nuclear power plants, the Trump administration would provide sensitive know-how and materials to a government whose de facto leader, Crown Prince Mohammed bin Salman, has suggested that he may eventually want a nuclear weapon as a hedge against Iran and has shown little concern for what the rest of the world thinks,” the newspaper claimed. At the forefront of these efforts, of course, are Kushner and his business interests. 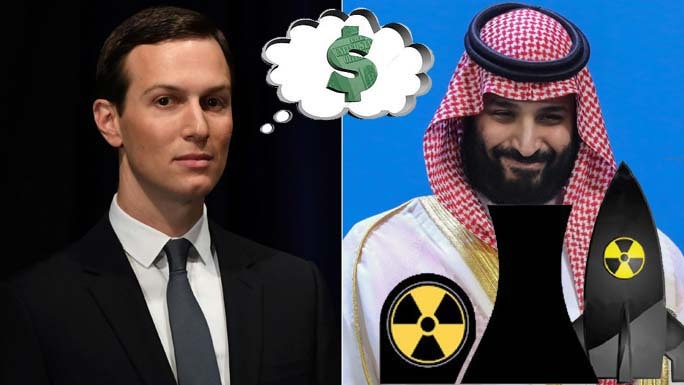 It turns out a company that bailed out his family after an ill-conceived real estate deal in New York brought them close to bankruptcy now intends to sell nuclear reactors in Saudi Arabia. That, along with other shenanigans, has gotten the US security establishment worried. Their attempts to cancel his security clearance, however, have been repeatedly overridden by his father-in-law. Hence, Kushner remains undeterred in his pursuit to nuclearise Saudi Arabia. In exposing this worrying reality, the US media, however, has made two very wrong assumptions: one, that a nuclear deal with Saudi Arabia somehow contradicts the interests of the Israeli leadership; two, that it is the result of some kind of a Gulf-money entrapment. ……. Given that President Donald Trump’s son-in-law has been the principal driving force behind a “peace plan” that aims to strip Palestinians of all their legitimate rights and legalise the Israeli occupation, it is hard to believe that he is now pursuing a policy that contradicts Israeli interests. ……. World powers are meeting with Iran on Wednesday in Vienna. 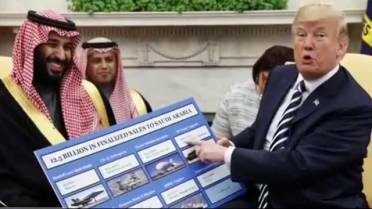 “………Focus on Saudi Arabia’s nuclear program has risen in the last month after the U.S. Congress opened an investigation into the potentially illegal transfer of sensitive technologies to the kingdom. This week the International Atomic Energy Agency, responsible for verifying that countries don’t divert material for weapons, weighed in on what its inspectors need before the kingdom can start generating nuclear power. Focus on Saudi Arabia’s nuclear program has risen in the last month after the U.S. Congress opened an investigation into the potentially illegal transfer of sensitive technologies to the kingdom. This week the International Atomic Energy Agency, responsible for verifying that countries don’t divert material for weapons, weighed in on what its inspectors need before the kingdom can start generating nuclear power. Riyadh’s nuclear program is developing “based on an old text” of safeguard rules, even as it expects to complete its first research reactor this year and plans to tap uraniumreserves, according to IAEA Director General Yukiya Amano, who told journalists this week in Vienna that he’s “appealing to all countries to rescind” those old ways of doing business. the IAEA comments could strike a precautionary note among vendors lining up to service the kingdom’s nuclear ambitions. Receiving the imprimatur of IAEA inspectors, who account for gram-level quantities of nuclear material worldwide, is a precondition for receiving technologies and fuel. Without reaching a new understanding with monitors, Saudi plans for 3.2 gigawatts of atomic power by the end next decade could flounder. ……. Maintaining that level of IAEA access to Iran’s nuclear program is the reason that China, France, Germany, Russia and the U.K. continue to defy U.S. calls to abandon the 2015 deal and reimpose sanctions. Diplomats from those countries convened Wednesday in Vienna in their first meeting since the European Union established a trade channel to skirt U.S. threats. “sensitive nuclear technology” to Saudi Arabia to benefit US companies.